When it gets too nasty to do nourishment work. 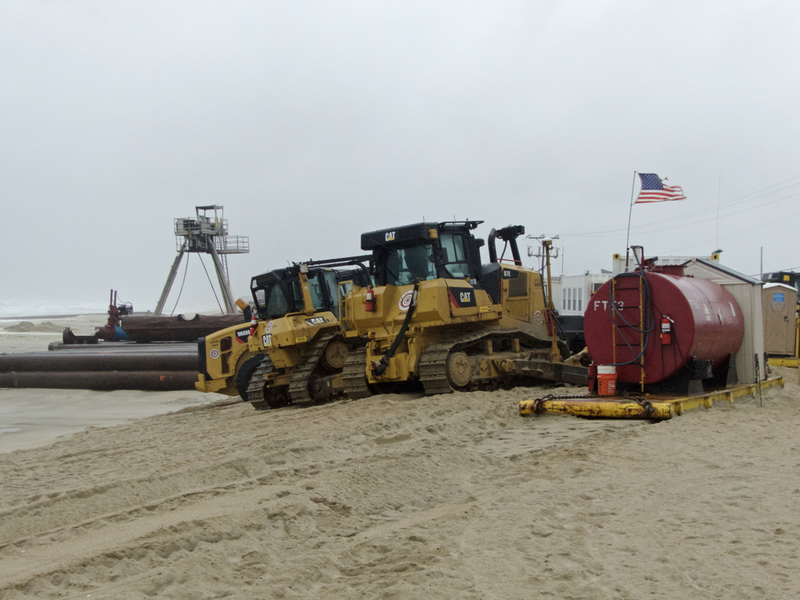 Nourishment equipment parked at Wilkins Street ramp in Kitty Hawk. Will the latest system off the South Carolina coast become Tropical Storm Irma? Does it really matter? The answers are, in the order asked: Maybe, although it’s looking a bit doubtful. And…no not really. Will It Get a Name? Naming a tropical system means the storm has met certain criteria that the National Weather Service uses to designate a tropical system. Mostly that there is a core of circulation with thunderstorms forming around that core. Potential Tropical Cyclone Ten, which will become TS Irma if it is named, does not have a well-defined center of circulation. So poorly defined is what might be a center of circulation that the National Hurricane Center isn’t sure exactly where it is, or if there is one…at least in their 11 p.m. report. What Potential Tropical Cyclone Ten is at this point is nasty coastal storm. It’s a little bit like a strong nor’easter only a lot warmer. There’s a lot of wind and rain, but a far cry from some of the more powerful nor’easters or tropical systems we’ve seen. If Potential Tropical Cyclone Ten was named Irma tomorrow, that wouldn’t change anything. The all of the forecast models are in agreement that the storm will brush the Outer Banks and then hurry out to sea. Whether it’s a named storm or just a strong one, the track of the system remains the same and there’s very little chance it will intensify by tomorrow. This is the first test of the sections of beach that have been nourished. We haven’t had a chance to see what’s happening along the shoreline yet, although a quick first glimpse in Kitty Hawk seemed to indicate all is well. There will be some loss of sand, but that is a design feature. The sand will form a sandbar that is the first line of protection for the shoreline. It’s important to remember that beach nourishment is a shoreline protection tool. A byproduct of the process is a wider beach, but reason for nourishment project is to protect infrastructure and property.